If you hoped for some resolution to the Negan/Jadis road trip in this episode, you must be new to the show, because that’s exactly the kind of story thread The Walking Dead loves to dangle unresolved for a couple weeks. Instead, we finally witness the much-discussed assault on Hilltop, which looks like a win for the good guys until a surprise epilogue scores big, bloody points for the Saviors. We also see Morgan get haunted by the world’s most annoying ghost and are reminded why no one in their right mind should feel safe around anyone under the age of 15. 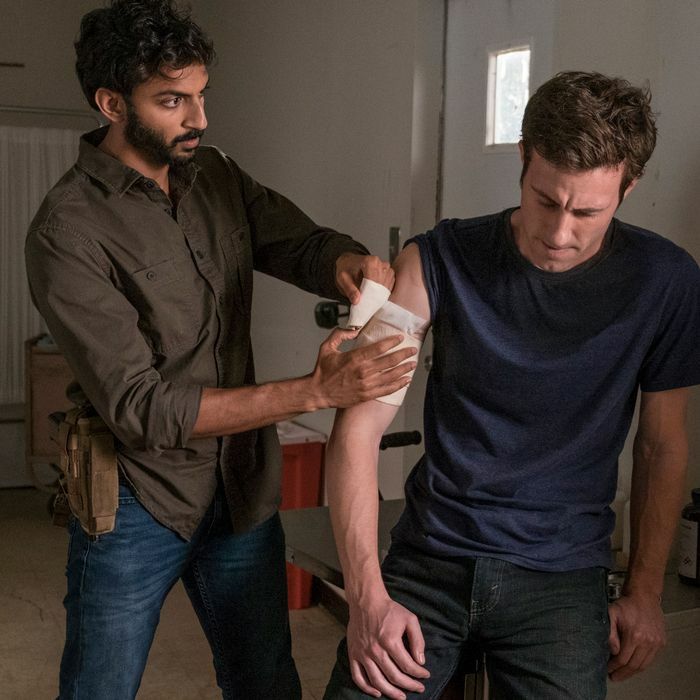 Simon makes good on his promise of a new day for the Saviors, but shifts the plan of attack from “infection to conclusion.” That’s a smart (and manipulative) bit of storytelling sleight of hand on the part of the show’s writers, since now we’re not thinking about that zombie-gore bath that the Saviors gave their weapons. “Maggie Rhee, the Widow” introduces herself to Simon by walkie, and the “good guy” Savior, Alden, tries to broker peace: “Too nice a night to spend it dying slow, don’t you think?” Strong line, dude, but Simon responds in Trumpian fashion — he prefers Saviors who don’t get captured. Aside from a handful of deaths and some minor annoyances — like that A-hole who gives Siddiq a hard time for no good reason, and Gregory’s continued existence — Hilltop is in pretty decent post-battle shape. Maggie hears well-earned praise from her sergeant-at-arms and a Hilltop rando for her leadership. But things in this world are fine until they aren’t, and that switch flips quickly. Carol’s old flame, Tobin, handled her real talk about their brief dalliance rather well — she also told Henry that he’ll die if he fights, like this is Scared Straight: Apocalypse Edition — but what Tobin handles less well is his wound. As soon as he started looking pale, the lightbulb clicked on for me: There’s zombie guts on them Savior blades, people! Apparently their bullets, too, which seems like a stretch, but doesn’t even rate on the implausibility scale for this show. What does rate as absurd, however, is the utterly ridiculous stealth of the walking class. Upstairs in the mansion, necks are being devoured while groans and moans fill the air, yet no one sleeping on floors in close proximity even stirs. The pièce de résistance is the gimpy rando who thanked Maggie earlier. After he turns, he tumbles down the stairs without anyone waking up. If that’s the low point of the zombie sleeper-cell scene, the best moment comes when Jesus and Michonne team up for a HOF-level kill: He pins a walker to the wall with a kick, she finishes with a sword through the head. Later, Carol has one last tender moment with Tobin as he growls and tries to eat her face before he’s put down like a rabid dog. Ah, what could have been. The episode’s title, “Do Not Send Us Astray,” comes from a prayer for the dead, and perhaps a warning for the living not to follow the departed to the grave. But Maggie and Rick are struggling to temper their need for vengeance with the greater good. By sunup, Henry is missing, and if anyone had a lick of sense, they’d lock those gates tight. Good Savior Al and a few compatriots pledge their allegiance to the Widow Rhee (which I think Maggie should start using regularly because it lends a certain air of mystery and intimidation than one really needs when developing a personal brand in the apocalypse). Morgan’s ghost is still screaming. More graves are dug. The only one that matters, though — to Rick, to Maggie, and to us — is Negan’s.